a heavy load. Know your vehicle weight and load, and follow the PSI recommendations specific to your motorcycle. Failure to do so can result in adverse motorcycle handling (wobble and weave) or tire failure, or both. Check your tire pressure often and adjust as necessary, using an accurate tire gauge. Motorcycle tire manufacturers recommend checking pressure at least once a week. However, many motorcycle safety experts recommend checking tire pressure and tread wear every time you take your bike out. After all, you ask more of your motorcycle tires than you do your car tires. So it's wise to ensure they're roadworthy each time you ride. Take the time to frequently inspect your tires for sidewall and tread groove cracking, punctures, blisters, knots, cuts, excessive or irregular wear. As with tire pressure, it only takes a few minutes — every time you ride is not too often. If you do find any of these tread wear conditions, immediately replace the damaged tire. In addition, most tire safety experts recommend replacing rather than attempting to permanently patch a tire. When your tread is worn down to the level of the built-in tread wear bars on your tires, the tread won't provide good traction. This is yet another indication it's time for new tires. Check your tires for signs of aging, including dry rot and cracking. Even barely used tires become hard with time or exposure to the sun. When tire rubber gets hard and stiff, it tends to crack and cannot grip the road to provide proper traction. So it's wise to replace old or dried-out tires even if they still have plenty of tread on them. If you store your motorcycle during winter months, be sure to store it in a cool, dry place, out of direct sunlight — and away from ozone-producing appliances (anything with an electric motor, such as a refrigerator). Additionally, your tires should not come into sustained contact with gasoline or oil. Improper storage will rapidly accelerate the normal aging process, making your tires unsafe. Make sure you get a matching set of front and rear tires. Unlike car tires, you need to make sure that your motorcycle tires are a “matched” set. At a minimum, they should have complementary tread patterns, should both be either radial or bias ply, and ideally be the same make and model. Size matters. 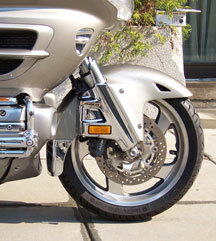 It’s best to choose replacement tires of the same size as the motorcycle’s original equipment tires. complementary make, model and size. Constantly monitor the way your motorcycle rides so you can detect any rapid air loss — and respond appropriately without delay. Click Here to find out how to handle a motorcycle tire blowout. Carry a cell phone whenever you ride, in case of emergencies.